In this video, This Old House general contractor Tom Silva shares tips for fixing a drafty door. 1. With a utility knife cut through the paint layer along the joint between the doorjamb and old weatherstripping. 2. Pry off the old weatherstripping from the jamb with a 5-in-1 painter's tool. 3. 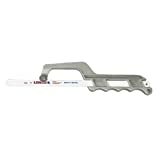 Use a hacksaw to cut new aluminum weatherstripping to fit across the bottom, exterior surface of the door. 4. Remove all nails and screws from the doorjambs, then sand the jambs smooth with 100-grit sandpaper. Close the door. 5. Drill screw-pilot holes into the bottom, exterior surface of the door, then attach the aluminum weatherstripping with the screws provided. 6. Use the hacksaw to cut foam weatherstripping to fit around the exterior of the door. Cut two pieces of weatherstripping for the side jambs and one for the head jamb. 7. Attach the foam weatherstripping to the jambs with 1-inch nails.